Clausen Oysters is the largest oyster farm in the State of Oregon. Pacific Oysters are grown on 600 leased acres in Coos Bay and harvested year-round. 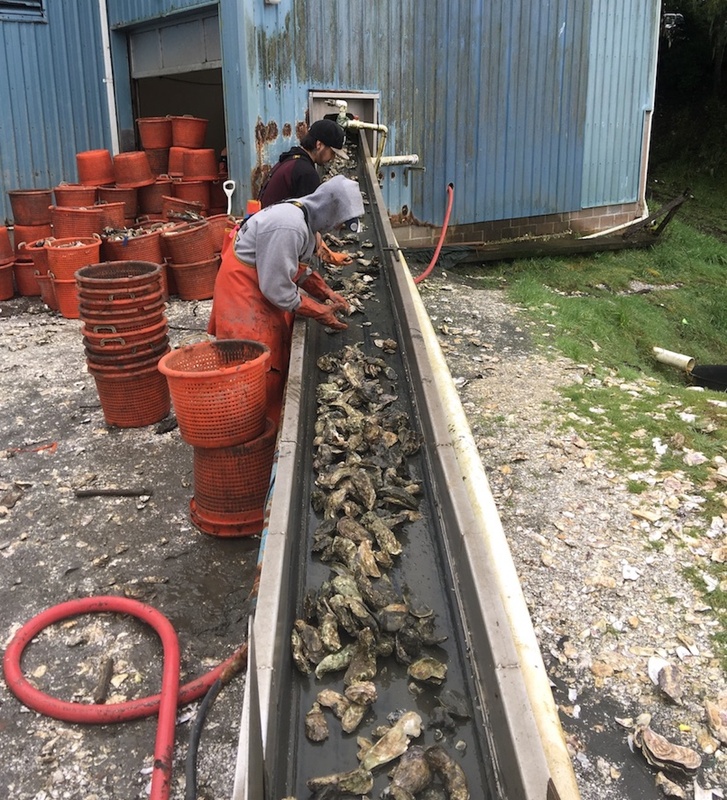 Fresh and shucked oysters are shipped to seafood distributors for the wholesale market and sold locally to restaurants and to the public in our on-site store. At Clausen Oysters, oyster larvae, about the size of pepper flakes, are taken and put on to an oyster shell. These shells are put in huge water tanks for three days allowing the larvae time to attach to the shell where they will remain for their lifetime. Then, these oyster shells are taken out on a barge especially made for shallow water and spread out on oyster beds. The oysters take about 3 years to grow forming groups of clusters on stakes in the tide lands. There are many different types of oysters but the ones Clausen’s currently grows are the Pacific oyster and the sweeter Kumamoto oysters. Oysters are very high in nutrients, especially zinc. Zinc is very important for the immune system, as well as in brain chemistry. It also is important to the prostate gland, hence an aphrodisiac. They are delicious mollusks that provide the human body with a number of unique nutrients and minerals, which result in great health benefits. These include the ability of oysters to aid in weight loss, boost metabolic activity, increase tissue repair and growth, lower cholesterol levels, reduce blood pressure, improve immune functions, aid in wound healing, and promote healthy growth. Furthermore, they are a powerful aphrodisiac, can improve blood circulation, and also increase bone strength to reduce osteoporosis. A good rule for longer shelf-life is to treat all fresh and frozen shellfish like ice cream. Don't leave shellfish in the trunk of your car, get them into the refrigerator as soon as possible. Optimum storage temp for shucked oysters is 32-36 °F. and fresh oysters in the shell should be 33-40 °F. Fresh oysters need to be stored cup side up to retain the oyster liquor inside. This is because oysters drip sea water at clock like intervals after being removed from the sea. They react with the flood and ebb tides, as in their natural environment. Fresh oysters, and so much more. I love Clausen Oysters. This is primarily a take out service. Under new ownership, the oysters are cleaner, and oh so delicious. Also available you will find, in the freezer, oyster stew, some fish, and local meats. I am told there are plan to offer oyster stew and beer -perfect apres hike fare. Also in the cooler are smoked oysters. Oregon oysters can be huge compared to varieties from the East Coast. A medium oyster is upto 6" long, so if you're used to East Coast style oysters, order the small or extra small. You can get them shucked or not, and Oregon oysters are stubborn devils, so I always buy shucked. Also available on the counter are hot sauces, jams and cranberry products. They will also set you up with oyster shooters, but no gin or vodka is served to accompany - yet. Clausens grows the best tasting oysters in Oregon. 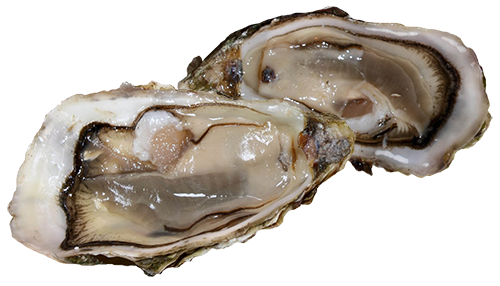 Oysters are available raw in shell and in half pints, pints, and quarts. If you love oysters, be sure and visit Clausens. This is not a restaurant, but a great place to pick up some oysters for snacking or to make oyster stew. Best place to get fresh oysters for summer bbq. Oysters in various sizes and species. In the shell and shucked available. Friendly, knowledgeable staff. Best oysters! Even better than back home in Tomales Bay. The oysters are much bigger and tastier. I am definitely addicted to them. And here I get more bang for my bucks plus the ladies at the counter were very friendly and efficient. Only bad thing is I'm a 9 hour drive away. Can't wait till Deli/restaurant opens!!!! Shooters! fried oysters! Oyster everything! definitely will be a Hot spot with a real Iron Chef! I'am In! but for now I'll still pick up fresh Oysters! I can hear these guys every morning on the Oyster Boats getting fresh Oysters from my kitchen window! Yum! Been eating this delicious shellfish here since the 1980's. Always a pleasure doing business with Clausen Oysters. Fresh oysters right out of the bay. Cant get any fresher! customer service is excellent, very friendly and knowledgeable staff. Makes our bi-annual dune trip that much more fun! The sweet smoked oysters were my favorite. The "small" raw oysters were huge and SO fresh! The staff was wonderful. They answered all our questions, let us sit outside, and brought us a beautiful giant tray of raw shucked oysters! Great place! Travelers driving North or South on Highway 101, North of North Bend and North of McCullough Bridge, will see our signs. We are easy to find, just one mile East of Highway 101.